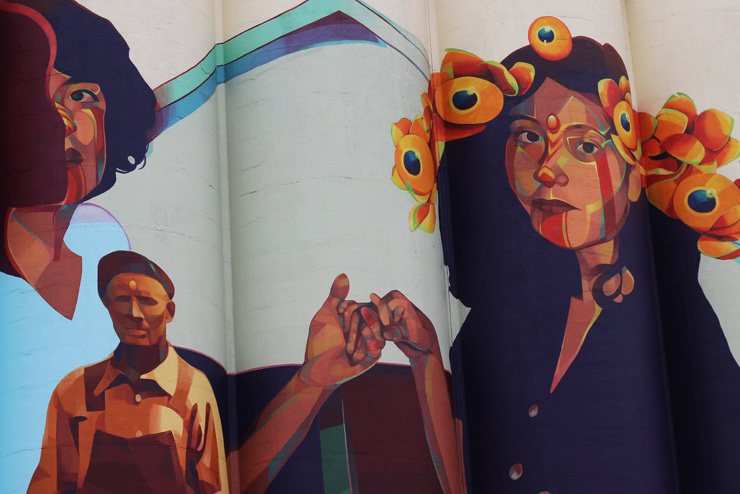 A blended composition of communities in a somewhat theatrical and warmly surreal rendering with personal features and cross-cultural decorative finesse, these folks painted across 17 silos in Witchita are not just going for special effects. 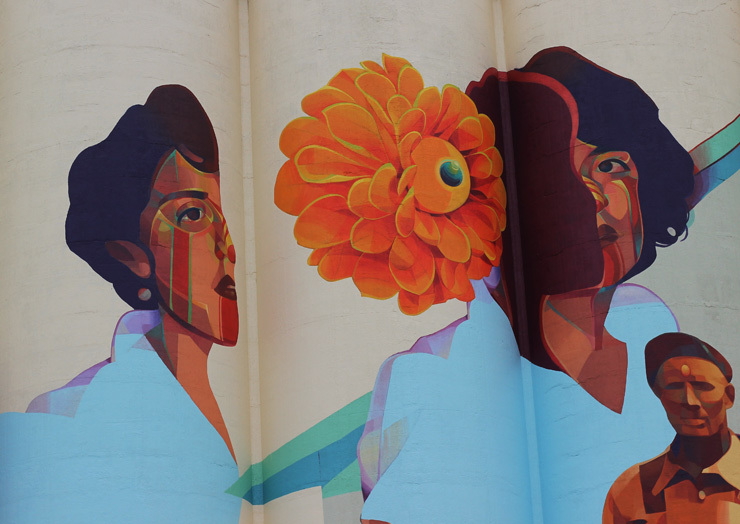 With a meditation on otherness and inclusiveness, Colombian muralist Gleo has brought the all the neighbors to this wall, intermingling social justice themes with characters and human nature – all passed through her mystical subconscious, her appreciation for ancestral cultures, and layered visual vocabulary. Organized by multi-disciplinary artist Armando Minjarez the new composition is part of a public painting program and community engagement project called Horizontes that is meant to give visibility to two underrepresented neighborhoods in north Wichita, the predominantly Latino NorthEnd neighborhood and the historically African American Northeast neighborhood. It looks like a stunningly effective and positive project that draws attention to groups of people who can be rendered invisible by industrial strength systemic blindness. 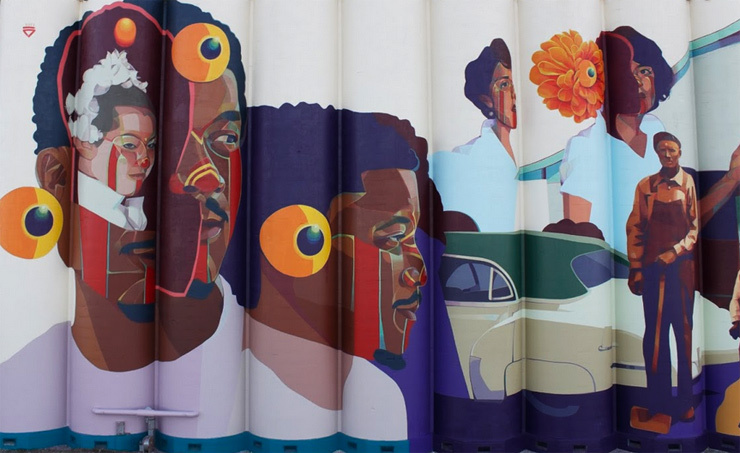 Aside from its size (4,500 sm), its 650 gallons of paint, and its time and cost overruns with 5 assistants over 11 weeks, the new community mural keeps the conversation fresh, and gives a pretty modern face to the city. 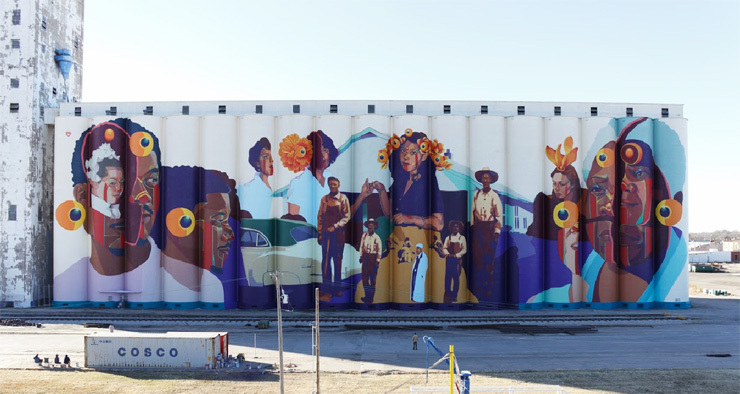 Public art initiatives like this can be a powerful key to fostering community – these Witchita neighborhoods are both physically and psychologically separated by these large grain elevators. 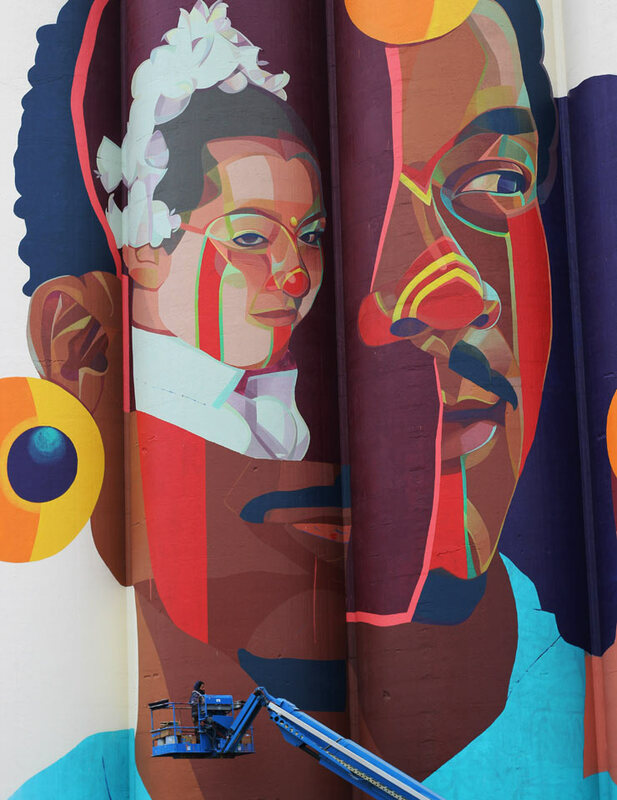 The concept of community mural continues to evolve and this one shows promise for engaging modern ways to address social issues while honoring people and traditions.